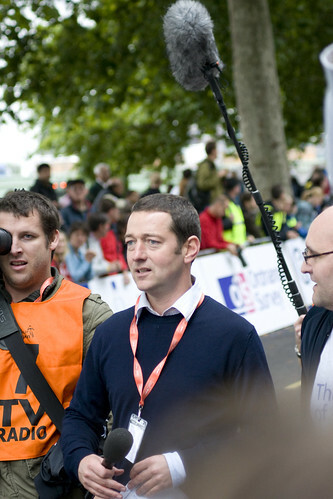 Ned Boulting, known to legions of British cycling fans for his work covering pro cycling for ITV, chats to Freewheeling France. 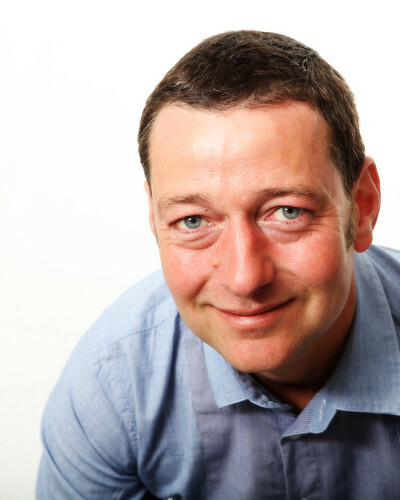 He's just published his first book, How I Won the Yellow Jumper, one of the most entertaining Tour de France books of the year. By Lynette Eyb. In the book you chart some of your more embarrassing moments in front of the camera (you use the word 'shambolic' in relation to an interview with Laurent Fignon). What's the most embarrassing moment of them all? You mean aside from downgrading the Maillot Jaune to a piece of knitwear? Generally speaking the most excrutiating stuff never sees the light of day, thankfully. I was stung by a wasp once doing a walking/talking piece to camera and fell in a ditch (pretty standard It'll Be All Right On The Night fare). And another time Robbie Hunter threatened to cut my throat. I still don't really get what it was that I had said to upset him so much. It was the Tour (2008) when Barloworld lost Soler, got busted and lost another rider, then two more the following day in a bizarre accident. You make light of the times it's all gone wrong but there are some pretty good bits in there too. Do you have a Tour interview or report you're most proud of? Stefan Schuhmacher, after his Time Trial win in 2008. I smelled a rat. I invited him to explain his positive test result (conducted by the police) for amphetamines earlier that year. He wasn't happy. I got dog's abuse on the emails and viewer complaints by the sackful. In October he returned a positive for EPO for a sample given minutes after I conducted that very interview. I don't confront riders lightly or spitefully or for fun. I had good reason not to trust his ride that day. Can someone who studied modern languages at Cambridge really be as bad at French as you say you are? Most certainly. Cambridge is not a good place to learn if you are merely mediocre. I was just a kid from Bedford who got lucky in the A Level and fluked my entry. When I got there I realised everyone else on the French course came from Swiss finishing schools and had grown up quattro-lingually in the European jet-set elite. Probably in Verbier. Top 3 most interesting riders you've followed? This is tricky. Immediately I gravitate to the bad boys. I'll try to keep it semi-clean. 1) David Millar. What's not to like? Apart from the doping. But that's part of his story. 2) Robbie McEwen. Feral. Bright-eyed. I wish I could see him win one more. Strangest thing you've seen covering the Tour? A donkey walking up the road during a downpour on the slopes of the Tourmalet last summer. It was peeing with rain. A gendarme wandered over to him, stroked his nose and fed him a chocolate croissant. Then they both went their separate ways. Either that or Woody's naked appearance at the bathroom window in Verbier. The book is quite personal, both in reference to yourself and to other people. The description of Mark Cavendish's PR guy ("He had that generic corporate German look, which is best suited to airport departure lounges and trade fairs ...") is particularly vivid – and you also describe meetings with him as "life-sapping". It's entertaining – and probably accurate – but were you worried about where to draw the line when you sat down to write about people who weren't, like the riders, already in the public eye? Yes, of course. I have to work with most of them in a few weeks. But I made an exception with "Wagner". He made my life pretty miserable. Besides PR is a carbuncle on backside of sport. They are, but please don't misunderstand: I'm not suggesting they are some great unsung army of selfless heroes... They're being paid to be there – we all are, but since they tend to pop up again each and every year, I suspect that they, just like me, have all been infected by the Tour, otherwise they wouldn't come. Actually, thinking about it, we may not constitute an army as such. But we do get medals. If you have been accredited 20 times by the Tour, (its director) Christian Prudhomme drops by during the final week and gives you a medal. We all gather round and clap. We always see the glamorous side of the Tour – I love the other mundane stuff you've covered too: trips to the laundromat, toilet facilities, wrinkles in shirts (and ways of obliterating them before going on camera), catering facilities... Was it your intention at the outset to include this sort of stuff alongside the actual cycling? There are lots of books about cycling. Not that many about cycling and urinating, as far as I am aware. And let's face it...which do we all do more often? I am glad you enjoyed that stuff. As I wrote, I found myself constantly wondering whether any of it was of the slightest interest to anyone other than the two other occupants of my car. But, weirdly, the day-to-day touring stuff seems to have been of equal, if not greater interest, to those who have read it. You were amazed when you started out how much access the media were given to riders – lists of hotels where they were staying and contact details. Do you think this is a historic thing – the result of the Tour being set up by a newspaper in whose interests it was to ensure the riders were accessible? I think so. The relationship between the rider and his sponsor is built into the language of the sport: "the TV breakaway", the hopeless attack 5k from the finish, zipping up the jersey just before taking the win. Most riders still grow up knowing that they have a responsibility to get themselves out there. Cavendish has always been very articulate about that aspect of bike racing. In theory, at least. I still haven't managed to prise his mobile number out of him. How has the media's relationship with the riders changed since you've been covering the Tour? I think the big difference is the emergence of HTC High Road, Sky and Garmin as powerful influences. US Postal always kept quite a tight reign on media access, as you might imagine, but the new Anglo-Saxon teams have upped the ante. They have fully fledged media operations which are designed to facilitate access, but often tend to produce the opposite of the desired outcome. Riders tend to hide behind the PR. And who can blame them? You never used to get that with Agritubel. When you found out Sky would own – not just sponsor – the new British team, you were worried ITV would lose the British broadcasting rights to Sky. But doesn't Sky's ownership of a team make it almost impossible for the Tour organisers to award broadcasting rights to a team owner and still maintain any semblance of credibility? How could the team owner/broadcaster guarantee impartial TV coverage if, say, one of their own riders tested positive, or some other scandal engulfed the Tour? That's a good queston. I don't know if ASO would necessarily consider that, though. If the price was right, I think they'd be tempted to sell, although the current Eurosport/ITV deal would take some unpicking. For a start, Eurosport have a Europe-wide deal, from which Sky would have to prise away the UK market, or set up a cartel of broadcasters themselves. Then there's the issue of free-to-air. ASO insists that the Tour is also sold free-to-air in each territory, which is why we can show it. Can Bradley Wiggins – or any other Sky rider – win the Tour anytime soon? No, I don't think so. I cannot say, with any conviction, that I can see this happening any time soon. Sorry – just being honest. The best place to watch the 2011 Tour (I mean in France – don't say 'at home on ITV')? I would never be so corporate as to say that, although, from a personal point of view, I sometimes yearn to be sitting at home watching it on the box with a glass of wine. I've never seen the Tour de France on the telly. Is it any good? On this year's route, I reckon Brittany could be special. The Mur de Bretagne is where I'd go – love that part of France. And they are PROPER bike fans up there. Other tips for people following the race? If you see a big grey accredited Renault Espace rearing up in your rear-view mirror and flashing its lights, I'd pull over and let it pass, if I were you. It might be us. Who'll win the 2011 Tour? 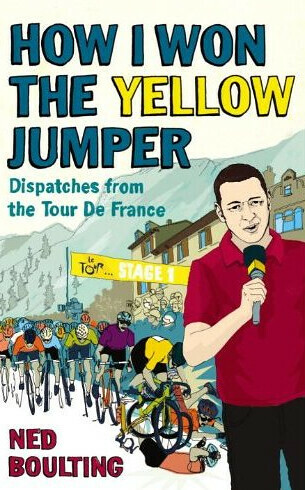 How I Won the Yellow Jumper: Dispatches from the Tour de France by Ned Boulting (Yellow Jersey Press) is out now. You can read our review here (we really, really liked it). See our Tour de France section for more on the race.